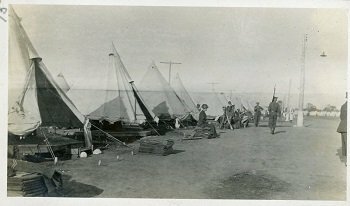 As part of the Centennial ending the fighting of the Great War (World War I), this weeks Throwback Thursday pic is of a military encampment. Taken around 1915, this photograph shows the tents of the 33rd and 34th battalion, location unknown. This military camp would be where new recruits camped while training and waiting to be sent overseas to the battlefields of Europe. If you are interested in this picture or other historic photographs of Windsor, please visit our digital exhibit ‘Windsor’s, History and Pictures’ at http://projects.windsorpubliclibrary.com/digi/index2.php.